Flippant attitude from their online presence in full force, vocalist/guitarist Sam Ray and guitarist John Toohey were quick to pop out of the high-octane songs right into banter about parents’ flights getting sent back because of the snow, the virtues of weed (Sam hollered “Give it up for weed!” intermittently throughout the set) and disparaging remarks to their new boss, Run For Cover head honcho Jeff Cassaza who flew into town for the show. 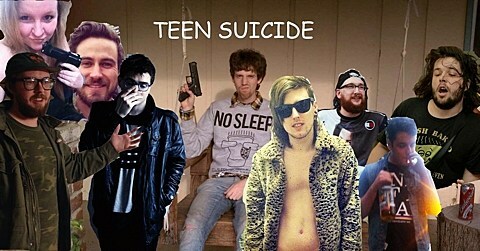 Teen Suicide had drummer Dexter Loos on loan from Alex G, and were in full-on rockstar mode for their set. Between the constant spins across the stage, monitor mounting and back-to-back shredding it was kind of difficult to remember that their songs are kind of, well, overwhelmingly depressing. The band played songs spanning their discography and also busted out a few new songs including one called “God” and one called “Alex,” both of which were a little more mellow than the band’s usual fare. The above quote is from our review on BV Chicago of Teen Suicide when we caught them on their recent tour with Alex G. (The tour hit NYC on 2/5 at Palisades.) The band don’t have another tour lined up at the moment, but Sam Ray (aka Ricky Eat Acid) & co. will play a free one-off in NYC on March 27 at Brooklyn Night Bazaar. 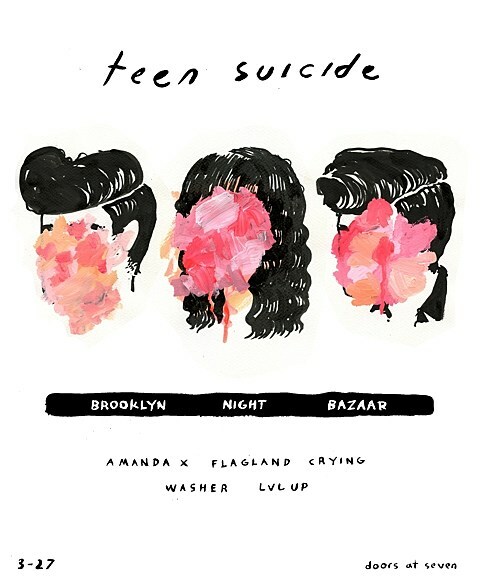 That show has a great lineup all around with Amanda X, Flagland, Crying, Washer and LVL UP. Though it’s a one-off for Teen Suicide, for Crying it’s the first date of their tour, the rest of which is with recent Double Double Whammy signee, Epoch member, and Frankie Cosmos collaborator Eskimeaux. All dates on that tour are listed below.